Are Democrats Turning Against the DREAM Act? Among those active in the immigration debate, the prevailing mood right now is impatience with Washington. With national action paralyzed, movement is mostly found at the state level, in places like Maryland, where the debate over a state-level DREAM Act is now unfolding. The Maryland DREAM Act was supposed to go into effect in July, but, earlier this summer, its opponents mounted a successful petition drive, stalling its implementation and subjecting it to a general referendum in 2012. A lawsuit initiated this week seeks to overturn the effects of the petition. Amid the back-and-forth is a bigger question: Why, in relatively liberal Maryland, has the law had such a hard time? And if this is what happens in Maryland, does comprehensive immigration reform stand a chance? The CASA de Maryland lawsuit, however, aims to prevent the referendum from taking place at all. CASA’s lawyers presented two arguments: first, that the law, because it makes appropriations, is not subject to referendum under the state constitution; and second, that the drive fell short of the required number of signatures. The suit alleges that the 44,000 petition signatures gathered online must be thrown out, and that roughly 13,000 other signatures are invalid in other ways. According to Amy Exelby of the Ballot Initiative Strategy Center, the online petition drive used in this case is without precedent, and the state should move cautiously due to the risk of fraud. Activists are hopeful about their chances. “Opponents are a very small, very vocal minority,” says Mate Vladar, a communications specialist at CASA. But it seems unwise to underestimate opponents’ organization, and it’s too soon to predict the outcome of the referendum if it goes forward. If the vote does take place—and the economy still hasn’t improved—the law’s supporters may have their work cut out for them. Immigrants have always made a handy scapegoat in tough times, and taxpayers may not have much of an appetite for tuition generosity. (McDonough has said the state is turning “into a Disneyland for illegal immigrants with benefits, attractions, and free rides.”) As Annie Linskey, who covers state politics for The Baltimore Sun, recently predicted, “if the voter registration trends from the petition hold, the law could be in trouble.” After all, she notes, over 30,000 of the petition’s signers—nearly one-third—were Democrats. To be sure, there are major differences between state-level DREAM Acts and the federal version: Besides the ability of the federal law to grant citizenship, state laws hit pocketbooks and neighborhoods in a manner that is more immediately obvious. 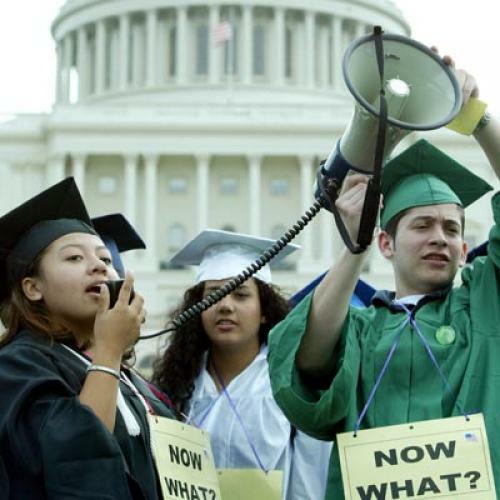 In one sense, then, the Maryland DREAM Act saga is not analogous to the federal effort. But tens of thousands of Democrats signed the petition against Maryland’s law. Were they protesting an apparent handout during tough economic times, or could there be a more serious divide between liberal elites and Democrats’ blue-collar base on this issue—something that might play out on the national level as well?